I founds these EPs in the trash along with some Olympus and Nikon Objectives and filters (long story). I want to know what the K, P, and G designate - I think the K is for Kellner and P for Plossl, but am unsure (I have no clue what G would be). Also what is the large 5X EP? The WF EP is a reticle framing eyepiece with 7.5, 10, and 15 etched on what appears to be 35mm frames (I am guessing the format). Anything will be of help. I believe the 'G' is also a photo eyepiece. Trash!!? 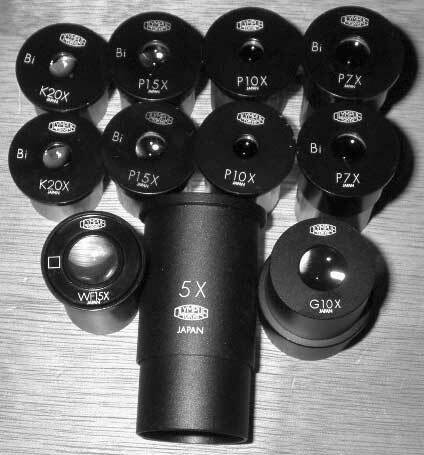 These are very valuable eyepieces. Keep checking that trash bin . . . Thanks. I did think P was for photo, but then why would they also be binocular (Bi)? Or is Bi = Birefringence? I believe Bi = Binocular. In other words, they have been matched (tested) in pairs to work well with one another. P might be plan, correction for field curvature. Don't know whether Oly used the german K for compensatory, but that might be right. G eyepieces are for the stereomicroscopes.